There are a lot of reasons businesses are installing solar panels on their buildings. It can help a company meet their goals of reducing their carbon footprint, which is a good move both for the environment and the reputation of the company within the San Francisco community. But making the switch the solar energy can also be good for a company’s bottom line; they can end up saving a large amount on their monthly energy bill, reducing their operating costs and putting that money right back into their profits. But are solar panels the right move for your business? There are a number of factors that you’ll need to consider and questions you’ll need to ask yourself before you make the commitment to this clean and renewable energy source. West Coast Solar works with San Francisco-area companies to design and install solar panel systems to help power their business. We put our experience to work and put together this guide of questions you should consider before giving us a call to get a free estimate on your solar panel project. How much are you willing to invest in the project? Solar panels are an investment in the future of your business. You’ll want to do some research and get quotes from companies in your area in order to get an idea of how much the project is going to cost. You’ll need to decide if you are willing to invest that amount into renewable energy for your business and whether or not you have the cash on hand to finance it. Many installation companies, West Coast Solar included, offer financing options for solar panels so you can pay for the cost over time. Remember, though, that the investment should result in lower monthly energy bills, so over time the panels could end up paying for themselves. Before you start to get estimates on your solar panel project, you’ll need to know how much energy you are using on average within your business. This will help the installation company understand your energy needs and design a system that’s right for you. If your energy needs are significant (for instance, if you are housing a large server), then solar energy may not be able to replace all of your energy consumption each month. However, even if you can meet half of the demand through solar energy, that’s half off of your monthly energy bill and back into your bottom line. Don’t assume that high energy consumption means solar energy won’t work for you. Are you trying to save money? Reduce your company’s carbon footprint? Get some good PR? 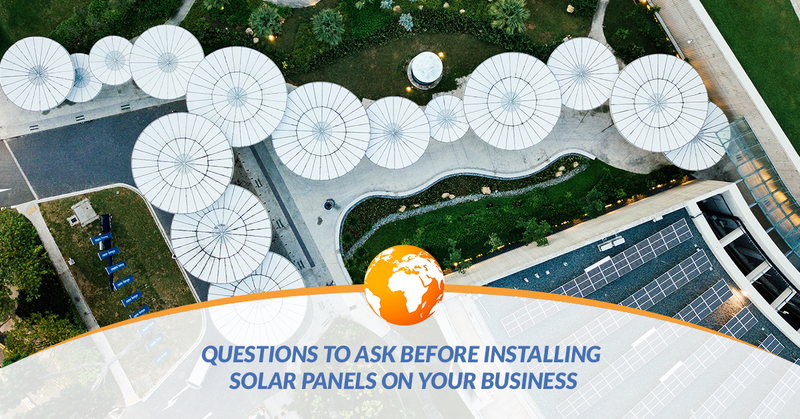 Be honest with yourself and your installation team about what your goals are for installing a solar energy system for your business. This will help them find the right products and design the right system for you. When you are clear about your goals, you are more likely to be happy with the final result. Whatever those goals might be, choose a company who has a clear plan about how to help you achieve them. Do you know your solar panel options? Not all solar panels are created equal. There are a lot of solar panel varieties on the market and new ones are coming out every day. You may wish to learn a little bit about the options available or simply talk to a solar power systems design expert instead. They’ll be able to tell you more about the options that are available to your business and which ones they’d recommend. You might discover options that are more powerful or more affordable than you imagined! There could be tax implications for installing solar panels for your business. There are a number of tax credits that could help your business reduce its annual tax bill and help you pay for the installation costs. Talk to your accountant before you have the system installed and see if there are any benefits available to you. If there are, it could be a powerful incentive to get the installation done within the next tax year! Do you have a contractor who knows how to install the panels? Ask for recommendations. If another business owner has had solar panels installed, find out if they were happy and if they’d recommend their contractor. Get quotes. Talking to businesses to get quotes on the project will give you a good idea of who you want to work with on the installation. A word of caution, though: the cheapest option isn’t always the best option, so take other factors like experience, reviews, and warranties into account. Read reviews. Look online to see what other people have to say about their experiences with the company. This can give you some insight into what your experience over the course of the project as well. Is Your Business Ready for Solar Energy? Then our business is ready to get to work. We have worked with businesses across the San Francisco area, designing and installing solar panel arrays that harness the power of the sun to produce clean, renewable energy to power their business. If you’ve been thinking about going green with your business’ energy needs, now is the time to call. We’ll tell you more about the products and services that we can provide your company with and even give you a free quote on your project. Simply give us a call or contact us by filling out the form on our website. A member of our team will get you started and get you a quote that you’ll love! Make this the year you bring renewable energy to your business.